Commissioner calls them unfair to building owners, mayor says the requirement is the law and will be enforced. Commissioner Jo Ann Hardesty and Mayor Ted Wheeler are clashing over the new city policy that requires owners of unreinforced masonry buildings to post placards warning they may be unsafe in major earthquakes. Hardesty has directed Portland Fire & Rescue, which she oversees, to pause enforcing the requirement, which is set to begin taking effect on March 1. But Wheeler said the requirement is still the law. He oversees the Bureau of Development Services, which also enforces it. "I stand by City Council's decision to pass an ordinance requiring the placement of placarding on unreinforced masonry buildings. We voted to take a small but important step to be transparent about identifying buildings that are at risk in an earthquake. These signs share basic information to the public about the safety of a building," Wheeler said Friday. The City Council passed the requirement in October, before Hardesty took her seat in January. "I will continue to work with Commissioner Hardesty and building owners to ensure the safety of all Portlanders," Wheeler said. The City Council approved the requirement, which is set to begin taking effect on March 1, before Hardesty took office in January. Many building owners have objected to the requirement before and after it was approved, saying it will discourage people from entering their buildings and reduce their value. They also say an agreement the city is requiring them to sign and record with their deed is an encumbrance that could affect their ability to sell or borrow money against their buildings in the future. Some owners have sued in federal court to stop the requirement, arguing it violated their free speech and due process rights. Those supporting the lawsuit include the Portland chapter of the NAACP, which says such placards would discourage attendance at and decrease the value of many African-American churches. Hardesty previously served as its president. In all, about 1500 buildings in Portland with unreinforced masonry are affected by the law. In addition to the churches, the requirement affects dozens of music venues in the city, including the Crystal Ballroom, Dante's, Keller Auditorium, Kells Irish Pub, the White Eagle Saloon. 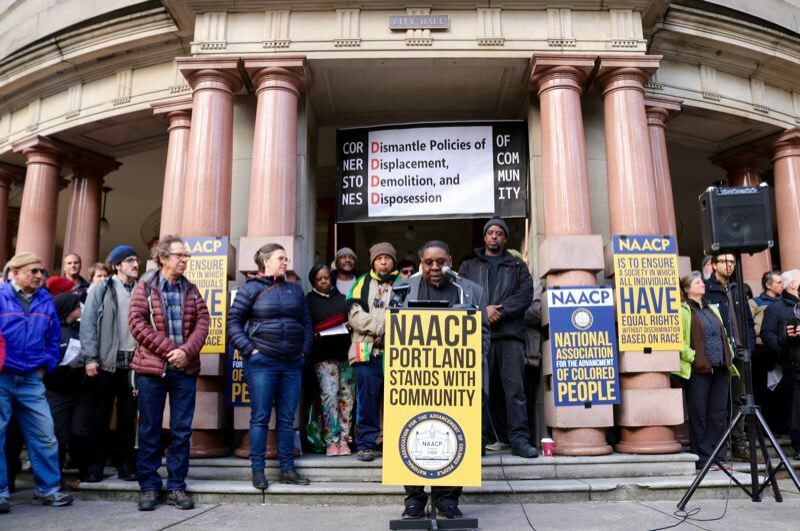 A number of groups — including MusicPortland, the NAACP, tenants rights organizations, Save Portland Buildings and the Council of Churches — protested outside City Hall on January 5 to highlight what they said are flaws in the requirement. Hardesty, who also also oversees the Portland Bureau of Emergency Management, asked that it continue to lead work sessions on the topic and to further investigate financial incentives that would make seismic upgrades feasible for many business owners and non-profit operators. The development services bureau has released a schedule of potential fines for not posting the placards that range from$257 per unit per month for buildings with one or two units, and increase to $515 per unit per month for buildings with 20 or more units. That means the owners of a 60-unit building that does not post the warning could be fined $38,350 a month. You can read a previous Portland Tribune story at www.tinyurl.com/y8ex84m9.